The easiest way to grant your spouse title to your home is via a quitclaim deed (Californians generally use an interspousal grant deed). With a quitclaim deed, you can name your spouse as the property’s joint owner. The quitclaim deed must include the property’s description, including its boundary lines. That is information you can obtain from your current deed. While you must include the amount the grantee is paying for it, don’t use zero as the amount if you are including your spouse. Instead, use $1 as the amount paid. Also, make it clear on the quitclaim deed that the two of you are joint owners. You will need to have the quitclaim deed notarized with the signatures of you and your spouse. Once this is done, the quitclaim deed replaces your former deed and the property officially is in both of your names. You must record the deed at your county office. Quitclaim deeds between spouses are usually not affected by tax considerations – with some exceptions. If your spouse is not a U.S. citizen, the gift tax exemption between spouses does not apply. Many states offer a homestead exemption that results in significant savings on property tax bills. It is possible that the addition of your spouse could cause you to lose the homestead exemption, and end up paying a lot more in property taxes. The best way to ensure this won’t happen is by consulting a tax attorney or accountant. Before putting your spouse on the deed, contact your mortgage lender. The lender has the right to refuse to allow you to put someone else on the deed, unless you are willing to pay back the loan amount immediately via the common “due on sale” clause in most mortgages. That clause kicks in if you try to change your interest in the house. The good news is that most lenders will waive the due on sale clause if you are conveying half of your home to your spouse. Keep in mind that the lender will want to check your spouse’s credit history. If you want to add your spouse to the mortgage, you will generally have to refinance your loan. A spouse with bad credit means you will pay a higher rate, so in that case, it doesn’t make sense to add them to the mortgage. On the other hand, if your spouse’s credit score is higher than yours, you might qualify for a lower rate. Do the math to ensure the refinancing fees don’t eat into your mortgage savings. If your spouse has a history of financial problems, putting them on the deed may have consequences. If your spouse has a judgment against them, either from a creditor or the government, and doesn’t pay it, there is a real possibility a creditor could sue and you are forced to sell your home to pay the debt. While that’s a worst-case scenario, it’s not the only one if your spouse has bad credit. Poor credit on your spouse’s part can render you ineligible for refinancing your home. When property is titled solely in your name, you can sell it or refinance it on your own. Once the property is titled in the names of both spouses, you’ll need your spouse’s permission – and he or she will need yours – to sell or refinance it. For most couples, this isn’t an issue, but it is important to note that by putting your spouse on the deed you are giving up partial control of the property. This is part of vesting of the property, and your spouse now has a vested interest. When you’re just married, neither person wants to think about losing their spouse. Yet you likely vowed “Until death we do part,” and if that’s the case, at some point one of you will become a widow or widower. When the house is in the names of both spouses, the probate process is easier. However, the title to your home should read “joint tenancy with right of survivorship” for the smoothest transition at this difficult time. In certain states, this is known as tenancy by the entireties. As a single person, you can exempt up to $250,000 for capital gains tax considerations when selling your home. Married couples filing jointly can exempt up to $500,000. However, your capital gains are calculated from your home’s basis, or the amount you paid for it. If you paid $150,000 for your home years ago and sell it for $400,000 years later, you wouldn’t pay capital gains tax on the $250,000 you received. 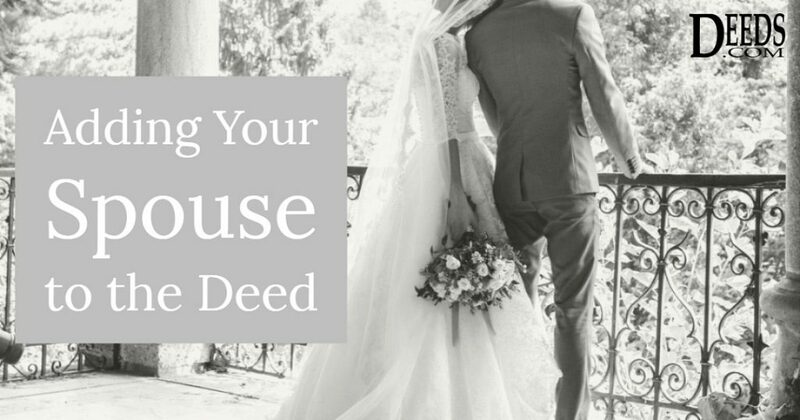 When you add your spouse to the deed, however, the spousal basis is still what you paid for the property. If you die first, after a long marriage, and your spouse sells that $100,000 house for $750,000, their capital gains totaled $650,000, and they must pay capital gains tax on $400,000. An alternative is transferring the property to your spouse via a Transfer on Death (TOD) deed. When you die, your spouse’s basis is the value of the property on your date of death. That means the house may already be worth $750,000, and your spouse won’t owe a dime in capital gains tax upon the sale. Next PostNext You’ve Paid Off the Mortgage. What Happens Now?